In 1973, the British economist E. F. Schumacher published the book “Small is beautiful”. Although he did not talk about mid-small caps, the sentence is widely used to champion small players in all kinds of businesses. French & Fama published in the 80s the famous study that showed that, historically, small-mid caps had outperformed the SP500, which is called the “small firm effect”. The lower panel shows the relative performance of the SP400 mid-caps versus the SP500 large-caps. During the last 6 years, mid-caps have outperformed large caps but not consistently, and so there are periods where large caps outperformed also. So what can we expect today and why? 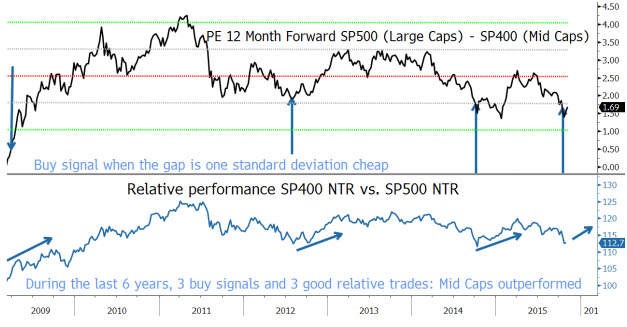 The upper panel shows the relative PE 12month forward of mid-caps vs large-caps. The graph displays the ratio during the last 6 years with +/-1 and +/-2 standard deviations. Even though it is only a rough trading rule, we can see that when the relative valuation is one standard deviation cheap (blue arrows), historically mid-caps have outperformed large-caps (lower panel). From the valuation standpoint we are in a good situation to overweight the mid-caps in the US equity market. Consensus earnings growth for SP400 mid-caps is 13.3% and 15.5% respectively for 2016 and 2017, whereas the consensus for the SP500 is 12.8% and 10.4% (IBES). Please, do not believe the absolute numbers, as analysts typically miss the growth by 6.5%, but the relative growth is what matters. The major victims of the strength of the USD are large caps which get a much higher proportion of their profits from overseas, so mid-caps will be more protected in this strong USD environment. Both indexes have important differences in terms of sector composition as can be seen in the table below. This composition confirms that mid-caps are more exposed to the domestic market. In a low return environment, it is important to be able to profit from relative trading opportunities. With valuations relatively more attractive and better fundamentals, US mid-caps might be a better place than large caps.